The Division of Geriatric Medicine & Gerontology at the UCI School of Medicine is made up of an interdisciplinary group of professionals whose mission is to address the changing health needs of older adults and those who love them. We are committed to delivering high-quality, comprehensive care in a variety of settings and to providing leadership in geriatric education, research, advocacy and community outreach. 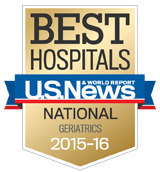 The skill and dedication of our physicians to elder care has led to UCI Medical Center being named repeatedly as one of the nation's best hospitals for geriatric care by U.S. News & World Report. As Americans live longer, the focus of health care must be on making people's later years both healthier and more meaningful. Our goal is to help our patients be their best whether they are in excellent health or in the late stages of such difficult illnesses as Alzheimer's disease or cancer, and to train future physicians and other clinical caregivers to do the same. With a $2-million grant from the Donald W. Reynolds Foundation, we are actively developing ways to further integrate physician training in the care of geriatric patients throughout UCI School of Medicine to ensure that our graduates meet national guidelines in patient care. As part of our Reynolds Grant program, we offer students innovative opportunities to work with older adults and gain experience in caring for patients with dementia. The Division of Geriatric Medicine & Gerontology is also nationally recognized for its Center of Excellence on Elder Abuse and Neglect, which provides medical, forensic and victim services to abused and neglected older adults. It also serves as a "living laboratory" of innovative approaches. Statewide, the center serves as a central source of technical assistance, best practice information, multidisciplinary training, useful research and relevant policy issues involving older adults.